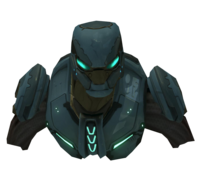 The Flight harness is a specialized Sangheili harness developed for use with the Tarasque-class heavy fighters and Gigas-class fighter-bombers. While structurally similar to the Assault harness, the helmet features a hyper-wave link for cleaner craft interactions and a mouth piece that retains a multi-port for use with older Tarasque-class heavy fighters and Gigas-class fighter-bombers. The more compact deltoid armor has less of an impact on the elite's range of motion in the cramped compartments of subluminal space craft and reduces overall fatigue in multi-phase interdiction missions. The less cumbersome cage utilizes aligned composites to postpone the onset of fatigue and the explicit primary environment multi-port is less restrictive than older helmet multi-port. Unlock: Complete the Halo 3 Campaign on Heroic or Legendary difficulty. Description: "Sealed helmet equipped with hyper-wave link for cleaner craft interaction; mouth piece retains multi-port for use in older TARASQUE heavy fighters and GIGAS fighter-bombers." Eye pieces are thinner, flatter, and are a light-sided blue or cyan instead of yellow and are farther back in the helmet than that of the Assault harness and Combat harness. The reason of being back farther along the helmet is akin in usage to that of EVA, as it is used in space. It features a pair of joined conspicuous gray circular plates located at the rear of the helmet, and a flexible neck guard, which is most likely vacuum sealed. Mandible guards are larger, feature bolts, and are fused together with a chin guard. Missing neck rings at the back of the neck. The helmet is more angular and shorter. Missing articulation lights at the back of the helmet by the cheek bone. The helmet has a pyramid shape if viewed from a certain angle. Unlock: Complete The Ark on Heroic difficulty. Description: "Compact deltoid protection has less impact on range of motion in cramped crew area of subliminal military craft: decrease overall fatigue during multi - phase interdiction missions." The shoulder pauldron is truncated and has a circular device at its center. This may be to reduce drag for flight, and the device may be the power source or the air tank. Unlock: Complete Tsavo Highway on Heroic difficulty. Description: "Less cumbersome cage utilizing aligned composites postpones onset of fatigue: explicit primary environment multi-port less restrictive then the older helmet based multi-port." The thoracic cage features an "I" shaped metal plate with a series of V shaped blue/cyan lights running down its length.